The weather has been so cold here that I’ve really been craving some solid comfort food. I decided to make some baked cheesy pasta with meatballs. I didn’t want to use mock meat in the meatballs, so I turned to the ‘meatiest’ vegetables I know to provide the texture and flavour – mushrooms and eggplant. They don’t look very pretty, but look past their ugly exterior. I am really happy to say that they worked out well. They hold together, the texture is good, with the smooth eggplant background, the small chunks of mushroom and onion and the breadcrumbs providing some extra chewiness. The flavour is great. You could feed them to your omni friends and family and I don’t think there would be any complaints! The recipe is a bit more complicated than I usually make, with the separate preparation of the eggplant and mushrooms and the appearance of a food processor, but they are worth the effort. 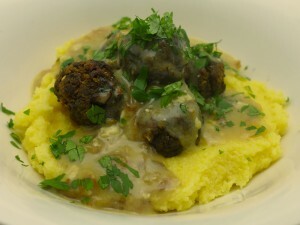 I ate them with some soft polenta and a sauce made from fried onion, stock, soymilk and lemon cashew cheese. I also used them in a baked pasta dish with a simple tomato sauce and some vegan Bio Life cheese. I think they would also be good as finger food with some relish. They’d make good burgers too. salt to taste - you probably will not need any. Chop the eggplant into 1cm cubes, put into a colander and toss with a couple of pinches of salt. Leave for half an hour to drain, rinse then squeeze as much liquid as you can with your hands. Heat the oil in a pan and fry the onion until it softens and colours. Add the crushed garlic and fry for 1 minute. Remove the onion and garlic from the pan and add to a mixing bowl. Add the eggplant to the frying pan and fry until soft and well cooked and brown. Puree the cooked eggplant in a a food processor. Fry the mushrooms until they release any liquid and they brown. Add the eggplant puree, the cooked mushrooms and all the remaining ingredients to the mixing bowl and mix thoroughly with your hands. Taste and salt if needed. Chill the mixture in the fridge for at least an hour. Form the mixture into balls and place on a baking sheet that has been lined with baking paper and sprayed with oil. Spray the balls with oil as well. Bake at 180deg C for 25-30 minutes turning them halfway through to make sure they brown on all sides. The flavour of this dish really depends on making sure you fry the vegetables properly. You need them to brown. I am a new subscriber to your blog and I really love how informative your posts are. I have been vegetarian for 20 years, the first two years I was vegan, but found it hard going. The cheese is a real challenge – I don’t eat dairy cheese at all – but am always on the look out for vegan cheeses. I know that years ago lots of vegan recipes would use nutritional yeast – but I have yet to find it. I don’t live in Melbourne – but it sounds as though it is the hub of all things vegan and thinking “outside the box”. I live in country NSW, and access to specific ingredients relies on the internet or travelling miles. I will try lots of your recipes. All your recipes sound and look delicious. I have a husband and two grown sons who eat the same diet. Thanks again for such a great blog. Nina. Thanks Nina. I do think cheese is the hardest thing for me. I do know that when I post about cheese on the blog that it gets the most views, so it’s obviously an issue for many vegans. I am not a fan of Nutritional yeast, yeah it is kind of cheesy, but for me, not in a great way. It is also sold as Savoury Yeast and I am sure you could get by mail from a vegan online store. I am glad you’re liking the blog.